A spinal cord injury can cause temporary or permanent paralysis, paraplegia, quadriplegia and even death. The recovery process is difficult, costly and a tremendous financial burden. The highly experienced lawyers at Giometti & Mereness P.C., have nearly three decades of experience in personal injury, wrongful death and insurance cases. We have the knowledge and ability to represent individuals, families and insurance companies in spinal cord injury-related cases. Our firm is committed to providing effective, efficient and quality legal representation. Call 303-333-1957 or e-mail us at our law firm, to schedule an appointment with one of our experienced Denver spinal cord injury attorneys. Serious car accidents and motorcycle accidents often lead to catastrophic injuries and damage to the spinal cord. Individuals can become paralyzed for life due to the reckless actions or negligence of another. We can represent you and your family in a personal injury or wrongful death case due to spinal cord injuries sustained in an accident. Giometti & Mereness P.C. also has experience in defending all types of spinal cord injury cases. We thoroughly evaluate and examine each case by looking at medical records to accurately determine the cost of care in spinal cord injury cases, the nature and extent of injuries, and other resulting damages. Contact us at our law firm in Denver, Colorado, to discuss your spinal cord injury case with one of our experienced Denver spinal injury attorneys. Schedule an initial consultation by calling 303-333-1957 or via e-mail. 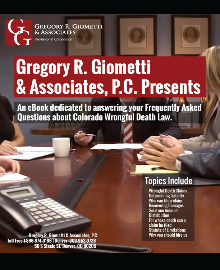 We are one of the most proficient and experienced personal injury, insurance and wrongful death law firms in Denver.